Seize the loot - or be looted! The return of the UVF? Pensions: who loses, who gains? Greece’s two union confederations, Gsee and Adedy, have called another general strike on 28 and 29 June, this time for 48 hours. It is to apply pressure on the parliamentary vote on the Pasok government’s new plan for cuts and privatisation, imposed in order to get new IMF, EU, and European Central Bank credit. Buses, air traffic, docks, power stations, etc. will be all be strikebound. Hospitals and health centres will operate emergency cover only. Greece’s small-business federation is also backing the site. Demetre Fraser, 21, from Peckham, south London, has died in suspicious circumstances after a visit from the West Midlands police. Staying in Birmingham as part of his bail conditions following an assault charge by his girlfriend (later withdrawn), Fraser was visited by police on 31 May, apparently for a routine check of his electronic tag. He died the same day after a fall from the 11th floor of the building where he was staying; the police insist the death was suicide, but neighbours report hearing a huge commotion and seeing evidence of a struggle. Further education (FE) lecturers are bracing themselves for a round of cuts taking effect in the autumn. Some colleges are already in dispute with management. Arwyn Thomas, an RMT (rail union) rep unfairly dismissed by London Underground management, was reinstated on 22 June to LU employment on drivers’ pay. Although he still faces downgrading and a sixth-month suspension (during which time he will be employed by the RMT as an organiser), his reinstatement is an enormous victory for Tube workers against a management which seemed, until recently, intransigent. 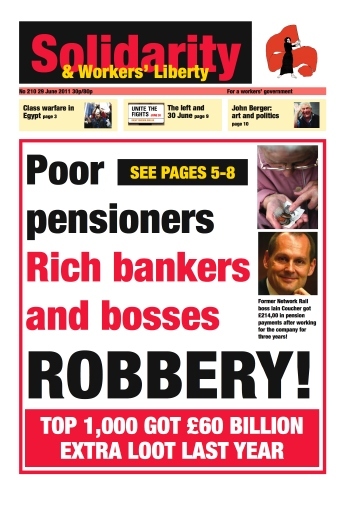 Public sector pensions strikers will be joined on June 30 by workers taking action in a number of local disputes. In south London, journalists continue to strike over job losses at Newsquest. 33 workers took to the picket line in Sutton on 27 June, the second strike in a month. As the sovereign decision making body of over one million public sector workers, Unison’s National Delegate Conference 2011 (21-24 June) should have been one of the most significant labour movement events in recent years. As the government tries to impose the biggest assault on working-class pension provision in the history of British capitalism, this conference was an opportunity to get our union geared up for action. British Airways cabin crew workers have voted overwhelmingly, by 92% on a 72% turnout, to accept a deal from management that restores an uneasy peace and ends a dispute which has seen nearly a month’s worth of strike action since 2009. Southampton council workers’ strike movement continues after talks with ACAS broke down in late June. Tuesday 28 June will see street cleaners, parking staff, refuse collectors, librarians and others take renewed strike action in a dispute that involves over 2,000 workers — members of Unison and Unite. The ins-and-outs of revolutionary organisation may seem like a “side issue” when set against some of the bigger, weightier-sounding concepts. That there is such a lot of confusion surrounding the question of how socialists can and should organise is a symptom of wider political misunderstandings.